Pound chicken breasts until they are even in thickness. In a small bowl, combine spices. Season both sides of the chicken breasts with spice mixture. In a large skillet, melt butter over medium heat. Brown chicken on both sides, about 5 minutes each side. Remove chicken from skillet and set aside on a plate. Pour chicken broth in pan and de-glaze (scrape brown bits off the bottom of pan). Stir in lime juice and cream. Increase heat to medium high, stirring constantly to make sure cream does not scald or burn to the bottom. Stir until slightly thickened. Reduce heat and whisk in shredded cheese. 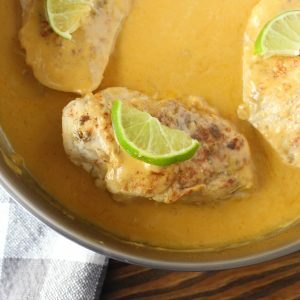 Return chicken breasts to pan, cover and cook on low until chicken is completely cooked through, stirring occasionally. Time will vary depending on the thickness of the chicken. Serve over rice with steamed asparagus or other veggies.